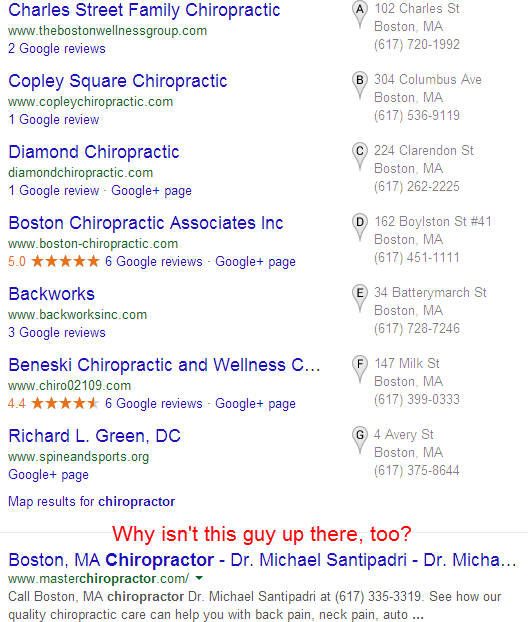 Do you rank page-one in the organic results, but seem locked out of the Google Places (AKA Google+ Local) results? …then you might have what I call “detached” local rankings. In other words, you’ve got an organic ranking right above or right below the “7-pack,” and you’re wondering why you don’t also have a ranking in the 7-pack. It’s a common problem. Business owners ask me about it all the time. Explanation 1: Your business is too far from the city where you want the Places rankings. There may be nothing you can do about this except to apply the best-practices I’m always harping on. Explanation 2: You show up in the Places results for other queries – just not the one you typed in. 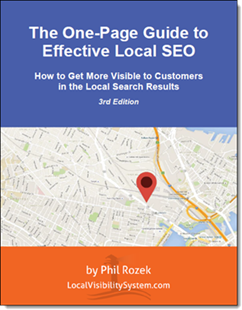 This one’s complex: Why you’re showing up in Places for some queries but not others depends on factors like point #1, whether you include the city name in your search term, where you’re physically sitting when you’re searching, and how many local competitors you have. Explanation 3: Your Google listing has been penalized. Make sure you’re kosher. Explanation 4: It’s too soon. If you just created your Google Places page, just wait a couple weeks. Explanation 5: Your Google listing may have the wrong categories. Explanation 6: You may not be presenting your NAP info correctly on your site. Explanation 7: Your site may have no NAP info at all. Explanation 8: The “URL” or “website” field in your citations may be empty on some of your listings, or it may contain wrong or inconsistent URLs. Explanation 9: Your business may have no citations – or too few. Do you have any experience with “detached” rankings? What worked for you? Or do you have them now, and you’re stumped? Leave a comment!